‘Codefest’ music festival rewards our team for the sixth year running! 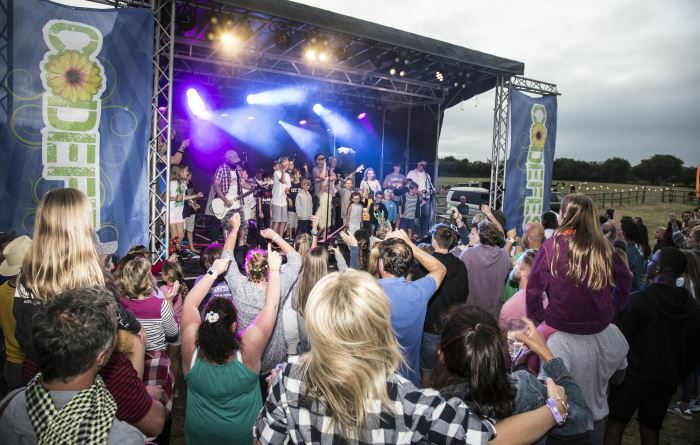 Last month, Codestone held our sixth annual ‘Codefest’ music festival – a charity weekend of live music, camping and revelry exclusively for our 105 staff, their family and friends. Taking place at Longthorns Farm campsite near Wareham in July, Codefest is a popular and greatly-anticipated event among our team. As well as raising invaluable funds for charity and rewarding employees for their hard work, Codefest provides a chance for directors, management and staff to get together outside work and enjoy a relaxing summer weekend. This year’s event featured a line-up of local bands plus a headline set from Coldplay tribute act, Viva la Coldplay and International Gatsby party band. Created with the whole family in mind, Codefest also included craft tents, face painting, henna tattoos and bouncy castles for younger attendees. Codefest is paid for solely by Codestone itself; our employees are simply asked to make a charity contribution as the cost of their admission. As a not-for-profit event, this year we raised £8,016.25, to be split between Dorset and Wiltshire children’s hospice, Julia’s House, and Project Luangwa, an education sponsorship programme in Zambia. We fundraise for these same two charities every year; Codefest has raised over £30,000 in total since the inaugural festival in 2012. This fundraising success is a fantastic motivation for the Codestone family, and builds on the sense of community and camaraderie the event was created to enhance. Codefest reflects our culture and company values regarding our employees; an emphasis on looking after employee wellbeing, valuing time outside of work and connecting with the community. Chairman and CEO, Jeremy Bucknell, says, “Now in its sixth year, Codefest has become a real passion for people, one of the highlights of summer and tickets go quicker and quicker each year. The ethos is simple, whilst we’re very passionate about what we do at Codestone, every now and then you need to get back to basics – switch off, kick back and relax with your people. Caroline Downing, People and Payroll Assistant, heads up the organisation of the weekend-long festival. “The team look forward to Codefest all year long, people plan their summer holidays around it. We take care not to aim it at any particular age group or demographic, and employees of all ages come along. It’s a wonderfully inclusive event. “Each year the event has grown, but the aim has always been to bring employees together in a relaxed atmosphere. The staff really appreciate the effort the board goes to making Codefest happen, it definitely boosts trust and loyalty within the company.